What is so special about this interview.? There are two things. 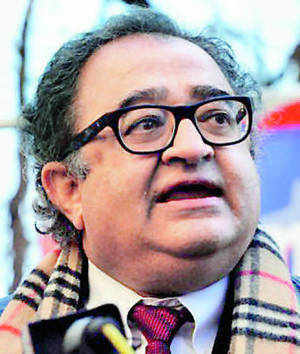 First is the way in which Mr Tarek Fatah replies. A person who is visiting India for the first time understands what exactly is going on here as far as so called secular politics is concerned. He refused to entertain the stories of so called 'persecution of Muslims' And 'Hindu fascism.' He advices Indian Muslims to be an integral part of Indian culture. This is one of the basic ideas of secularism . If someone is a Muslim and he is not blaming India, or weeping for injustice to Kashmir and is not cursing the so called Hindu extremism .... then he is a 'self hating Muslim. She is certain about ' rise of Right wing Hindutava fascism' but she asks 'Does India really have an Islamo-fascism problem? '.....Well done Aarti Tikoo Singh. "India does have an Islamo-fascism problem." " Why would Muslim parents not name their children after indigenous Indian names? Why do they have to constantly borrow from the Arabs or the Persians?" "If Muslim women cannot go to a mosque and sit in the front row, it is not a Hindu problem." "Indian Muslims have the Islamo-fascists feeding on the culture of victimhood who do not want it to be solved. If the discrimination that they perceive ends then the Islamo-fascists have no fodder to feed on. So they want to make it worse for the Muslims by telling them not to integrate." " I as a Muslim should today have rights that would have saved Mansur al- Hallaj from a torturous death in the tenth century. His body was ripped apart and his limbs were amputated because he said, 'Ana al-Haqq' (I am the light)." As a Muslim, i found it fascinating that India only place in the world where Muslims exert influence without fear. You're visiting India for the first time — what are your impressions? I'm relieved all my impressions turned out to be realistic — India is the only country offering a future in terms of what the nation state would be and how to accommodate languages, races and religions with all the difficulties that go with that. As a Muslim, i found it fascinating that this is the only place in the world where Muslims exert influence without fear. Muslims are better equipped in India than in Pakistan and Bangladesh. You lead a secular reformist movement for Muslims — did you find support from Indian liberals? I think they're puzzled. I felt the vast majority of Indian Muslims are open to the idea of a separation of religion and state. They've rejected Islamic states, voting to stay here — however, there is no leadership in the Muslim community that says, 'Not in my name'. I talked to prominent Muslims who said, "You're not going to make me deal with issues as a Muslim. I am an Indian. " But i feel they are abdicating the responsibility they have, as the only Muslims with the freedom to stand up against those who wish to take this freedom away. Actually, liberals across the world have abdicated this responsibility, indulging in what i call left-wing Orientalism. Islamo-fascism is not the result of economic deprivation. It is an ideological war, based on a death cult — you can't use conventional socio-political wisdom to address this. Unfortunately, the liberal Left, including socialist parties in America and India, doesn't admit they don't have it right. But they're making an error in thinking Islamo-fascism is linked with economic deprivation. Such thinkers should go on a sabbatical to Syria, Pakistan, Afghanistan, Aligarh — they'd be in for the shock of their lives. But serious questions remain in India about Muslims being discriminated against — isn't that of concern? I don't deny that — but i would rather live with discrimination, where i have the right to speak out, than live somewhere women and others are targeted in the name of Islam. Of course there's oppression in India too against women but nobody says it's an act of piety — it's 'dadagiri', not piety. It can be corrected with better enforcement of laws offering equality and protection. In the Islamic world, the law itself says women are inferior to men. Indian Muslims have a good thing going — but if you're not ensuring, for instance, that every girl is educated, you're making sure things don't become as good as they could be. It is the responsibility of liberal Muslims to discuss issues and say this or that is not acceptable. If Muslim women cannot go to a mosque and sit in the front row, it is not a Hindu problem. If Muslim men don't treat female relations with equal dignity, why are they complaining that others aren't doing so? The onus is on us. You can't fight fascism batting on the back foot. You've got to hit it out of the park. I put harsher responsibility on Indian Muslims because they are free, living in a democratic society. If they want to know what it's like to live under Islamic rule, they can see what`s happening in Pakistan. The above interview appeared in the print edition. The rest of the interview is exclusive to the web edition of The Times of India. Q: You were scheduled to talk at Jamia Milia Islamia, New Delhi, but the event was canceled for some reason. What happened? I blame the handful of people who exerted pressure but these people don't realize that by stifling my opinion, they made it go viral in an era of Twitter and Facebook. So I am not angry; I am just saddened by the religious Right of the Muslim community. This is not a reflection on the Indian Muslims. Most Muslims I have met here or talked to, whether it is Irfan Habib or Javed Akhtar, were appalled. But what happened at Jamia Milia is contemporary reaction even in the US, Britain, France where very few people are willing to challenge the Islamist discourse for fear of being dubbed as anti-Islam or Islamophobic. Q: Does India really have an Islamo-fascism problem? Isn't the problem in India primarily about Muslims being maimed in communal riots, persecuted for being Muslims and discriminated against by Hindus? First of all, India does have an Islamo-fascism problem. Otherwise why would the Jamia event get canceled despite the fact that it is a university led by a very leading intellectual in the Indian Muslim community? SIMI is not Made-In-Japan institution; it is indigenous to India. The Dukhtaran-e-Millat Kashmir fascists, the acid-throwing anarchists are indigenous to India. These are Muslim extremists. The Owaisi brothers have not been imported from Singapore; they are indigenous to Hyderabad. Indian Muslims have the Islamo-fascists feeding on the culture of victimhood who do not want it to be solved. If the discrimination that they perceive ends then the Islamo-fascists have no fodder to feed on. So they want to make it worse for the Muslims by telling them not to integrate. I would ask a question: Why would Muslim parents not name their children after indigenous Indian names? Why do they have to constantly borrow from the Arabs or the Persians? Q: India is struggling with various separatist violent movements in Kashmir, Northeast, Maoist bastions and the rise of Right wing Hindutava fascism. Aren't they as worrisome as Islamo-fascism? These movements within India can't be compared to Islamo-fascism. They are their own problems that are being addressed wrongly. The solution to these problems lies through democracy and not by taking up arms in a democratic state. If you are under a dictatorial regime, then I would support the taking up of arms. I support the Baloch guerillas for taking up arms in a country that is run by a military. But this is a democracy. You have to be patient in a democracy. Muslims adhering to Islamo-fascism and having the Left support it is a different issue. Q: Is your fight against Islamo-fascism relevant to India where secularism is understood and practiced very differently from what it is in the West? The Indian law does not permit criticism that offends religious sentiment. The very notion of Western law and all our civilization is based on European reaffirmation and anyone who suggests India's democracy is its own development is not telling the truth. The concept of a secret vote has stemmed from the French and American revolutions and the British coming to this part of the country, otherwise you would have, at best, the panchayat system. If the constitution does not say that you can't offend, then the constitution should say that you have the right to offend. You don't have the right to cause harm to a third person, but you should have the absolute right to have an opinion on any dogma, religious belief, on anything and express it. Many of the founding fathers or mothers of India were atheists. They mocked every religion. You can't be a member of the Communist Party and say well, I can't offend religion. Your existence is an offense to Christianity, Hinduism, Islam and Judaism. Anyone who has been a member of the Communist Party and is an atheist is de facto saying 'I don't believe in this nonsense'. So already you have determined that it is ok to offend. Otherwise the Communist Party of India would be banned. They have a 75-year-old history in this country. They are part and parcel of the independence movement of Bangladesh, Pakistan, Sri Lanka, India and Nepal. So if you take away the right to offend another religion, then let us put all the communists behind bars. I think India has a bright future, because no civilization has moved backwards. It is a scientific fact and this is based on history that the future is of societies where culture and custom play a secondary role to parliaments and legislatures. It ought not to be the other way. That is the nature of the ideal nation-state. We pass laws knowing that laws would be changed by future generations and thus improved upon, but we don't have religious dogma that can be changed by a future generation. Whether it is the Old Testament or the Quran or the Gita, there is no version 2.1 coming out. We have a choice- We protect our traditions because it is offensive to challenge them, and live as tribals following hierarchical or patriarchal societies, where the rights of women or minorities are a matter of tradition, OR we can build towards the society where traditions do not constrain us from building the ideal society, where men and women are equal, Black and White is equal and Hindu and Muslim is equal. But if you cannot push the notion that you cannot criticize a religion or its followers, then there is no democracy, then there is no free speech. I as a Muslim should today have rights that would have saved Mansur al- Hallaj from a torturous death in the tenth century. His body was ripped apart and his limbs were amputated because he said, 'Ana al-Haqq' (I am the light). He was the first Muslim atheist to have died when the Caliph begged him 'come on, you know, I am an atheist, you know that, let us make a compromise'. He said 'no, I would rather die than lie'. So people who are nonbelievers in any faith have as much a right to state their case. Q: Do you share the same optimism for India's neighbors, that is Bangladesh and Pakistan where you were born and raised? Pakistan will soon disintegrate. Pakistan is not a country. It is an idea. If you want to know what Pakistan is, then you go to Dhaka, not to Islamabad. None of the territories that comprise Pakistan today, had anything to do with Pakistan. The NWFP was governed by the Congress party. In the Punjab the Muslim League didn't win power. In Sindh they didn't get power, Balochistan was an independent state that Pakistan occupied with the military invasion, in Kashmir which Pakistan claims, Sheikh Abdullah had nothing to do with the type of thuggery that Mohammad Ali Jinnah was doing. And you go everywhere along the route, the only people that wanted Pakistan were the UPites, Biharis, north Indian Hindi belt Muslims who migrated to Karachi. And then they built Pakistan into a society that ruled us like colonial rulers. They destroyed and devastated the languages and cultures indigenous to the people of Pakistan and imposed Urdu on them and then made the entire Punjab Muslim community deny its own language by banning it from official institutions. So today, we have the result that in the Punjab assembly, you are not allowed to speak in Punjabi. It is a dismal case of pan-Islamism, that has been an experiment which failed in 1971. It failed much earlier in fact, because people after people, regime after regime invoked pan-Islamism to kill Muslims. So forget about Pakistan. At some stage, it will wither away. At some stage, Balochistan has to secede. It is the fifth civil war they are fighting against the Pakistani military. The Pakistani military is an industrial mafia that controls everything from cereals to trucks to missiles to magazines to banks. It is the most vivid example of what President Roosevelt talked about the military-industrial complex. Bangladesh, on the other hand, is an incredibly exciting place to be because that is where the Muslim vs the Islamist fight is taking place. You've got Islamists on one hand demanding the death penalty against anyone who is an atheist, and on the other bloggers who are less organized, have a bigger popular base but are naively saying that they are nonpolitical. Reminds me of Mao Tse Tung's ' a single spark can launch a prairie fire.' The bloggers have done that, so this fight is going there and my feeling is that even if they lose, the Shahbhag movement will in the end, succeed. As with other Muslim countries though, it is possible that any mediocrity on the part of leadership may have serious consequences. It is reflected in Syria and Egypt where despite the revolutions, things have gone worse. Q: You are working on your third book, 'Jinnah's Orphans'. Can you please explain the title? The current tragedy of the Indian subcontinent is a direct result of Mohd. Ali Jinnah's absurd philosophy of the Two Nation Theory and his refusal to compromise with Gandhi or Nehru and his complete adherence to the dictates of the Anglo-American enterprise which wanted Pakistan created because they saw that in a united India, they won't be able to get air force bases in the Himalayas where they were peeping right over the mountain tips to the Red Army which had entered Iran and set up the Kurdish republic and the Azheri republic. They also had King Zahir Shah who was a supporter of the Soviets. And you have to understand that the Baloch, who were separate, were also led by Mir Bizenjo who was a member of the Communist Party of India, Khair Bhaksh Marri who was also an Oxford Communist, and vast cadres of Left wing activists that drove the fear into the heart of Americans. So Pakistan was created primarily as a consequence by utilizing Islam to fight communism on the backs of ordinary Indian Muslims. No other Muslim people have been used like fodder like the northern Indian Muslim or the Pakistani Muslim, even the Bangladeshi Muslim. Hence Jinnah's Orphans! I am going to Dhaka and look at one million stateless people, the Biharis, who do not wish to be Bangladeshi, do not wish to be Indian, do not wish to be Pakistani and none of these countries want them. They are the quintessential orphans- the most vivid example of the tragedy that nobody wants to even resolve. But they are not the only ones. The three million dead Bangladeshis are also the orphans. Bangladeshis, the Khalistan movement, Pakistan's troubles, Balochistan's civil war, the bleeding issue of Kashmir since 1965, is a direct result of Jinnah's Two Nation Theory. Every victim of the Kashmir violence, whether it is the Kashmiri Pandits or the Kashmiri Muslims, the Chinese taking over Baltistan, the Pakistan Army destroying all Kashmiri culture and imposing Urdu and Punjabi over there- All these tragedies, I refer to as Jinnah's Orphans. The reason I am writing is that I haven't seen any non-fiction literature that has a composite view of what has happened as a result of Jinnah's Two Nation Theory. Q: Why do you blame only Jinnah? Nehru and Gandhi are guilty of giving in to Jinnah. Jinnah is the instrument. With Gandhi and Nehru, my beef is that they betrayed Badshah Khan. They left him to the dogs. Badshah Khan delivered the North Western Frontier Province to the Congress. Then Sardar Patel and Nehru in their wisdom decided that the Pashtun Indians were not worthy of being looked after and they suffered. And the Bengalis suffered because of that decision. So the blame is there on both Nehru and Gandhi. And on Gandhi to a bigger degree. Gandhi is the one who allowed Rs. 55 crore to be given to the government of Pakistan. The next day, Pakistan triggered the invasion of Kashmir. So many Kashmiris have died as a result of that. If Jinnah had not sent those tribals and the regular Pakistan Army into it, do you think we would have this tragedy? Kashmir would have been Indian or independent or a princely state where the Kashmiris would have decided what they wanted. Jinnah didn't want that and Kashmiris suffered. It is surprising that Kashmiris don't hold him responsible for their pain. Q: Perhaps, because India has caused Kashmiri Muslims graver political injustice. No? India has made catastrophic errors of judgment in Kashmir, right from the time when the United Nations Security Council resolutions demanded that Pakistan should withdraw all its Army and irregulars from all territories of Jammu and Kashmir, which is what India wanted. Yet that resolution subsequently started getting weaker after repeated vetoes by the USSR. If you notice the Pakistan movement, Kashmir was not a place where people were saying 'leke rahenge Pakistan, haath mein lota, muuh mein paan'. There were no pro-Pakistan slogans there. Frontier and Kashmir were not pro-Pakistan. They were led by Muslims who were more Muslim than Jinnah could ever be in a hundred lifetimes. They were pious people, Indian nationalists, dedicated to their supporters and both were betrayed by India. So India does not get scot-free. India's hands are bloody as well. But where as India's hands are bloody because of mistakes and errors of judgment, Pakistan's glee in making India bleed is a thought of evil. It is out of hatred. Q: Does India-Pakistan relationship have a future? If India-Pakistan relationship has a future, then where is the need of Pakistan? We already had a relationship. We were living in the same cities next-door to each other, especially in Punjab and Kashmir, where people didn't make friends based on religion. There were no segregated ghettos in Lahore which said Muslim quarter or a Hindu quarter. Kishen Nagar or the old city Lahore, the homes were next to each other. So if that is the point, then Pakistan ought to admit that they made a mistake. The day they say they made a mistake, the problem is resolved. India does not want to invade Pakistan, nobody wishes to invade anyone. It is Pakistanis who have the notion that we have the first strike capability and we can drop a bomb and we are not going to sign no first use. Why? It is Pakistan that says that Afghanistan should be subjugated to our colonial rule rather than let the Kabul have its own foreign policy and independent relations with New Delhi. By all accounts, Pakistan's ruling establishment, the civilian-military establishment is a rogue element that is playing the most vicious dangerous game after the cold war and putting the entire subcontinent at the brink of a nuclear catastrophe. Why can't Pakistan say 'no first use policy'? If Pakistan becomes a loose confederation of its federating units where the interests of the federating units, not the interests of its military-industrial complex, is legitimate, , where the native languages are allowed, and cultures and customs are allowed to flourish, rather than be dictated by Gulf-Arab states as to what is right and what is wrong, then, of course India and Pakistan can live as states and the past can be forgotten. We will be next-door neighbors like anyone else. Q: Are you a self-hating Muslim? No, but if there is something wrong that the Muslims do, why would I be constrained in telling them? Do you think the track record of Muslim leadership is anything to be proud of? Should I be proud of what happened at Jamia? Should I be proud of what's happening with the Syrians? Should I be proud of the Saudis? Tell me who to be proud of? What I am saying is that there is a scarcity of dignified, secular, liberal Muslims who are willing to be honest. If my honesty leads me to be accused of being an Uncle Tom or a self-hating Muslim, I am quite comfortable with that. My religion commands me to speak the truth and respect that truth even if it hurts you or your family and Quran is specific on that. If that is my fate, what would be my interest? My interest is the betterment of the Muslim people. I like to see them as philosophers, car drivers, the sculptors, and the dancers and the musicians, who the Muslims were during the era of rationalist movement in Baghdad.